← Love; Isn’t That What It’s Really About? I love the look of a classic mason jar. Lately, it seems like they are popping up everywhere! They are really inexpensive and because the jar has such a simple design, there is really so much you can do with them. 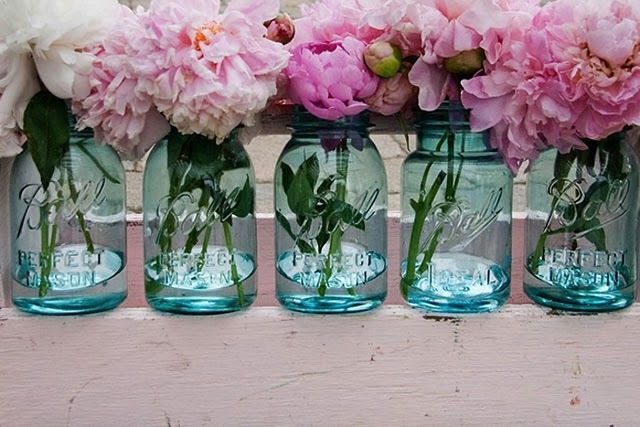 Here are nine ways you can use a mason jar at your wedding; whatever the season! 2. Pour water inside of the jar and place flowers or candles on top of the water. Cut flower heads and place them on top of the water. Instead of flowers, you can also use tealight candles. They will float on top and create an ethereal effect. 3. Fill them with an arrangement. They make great centerpieces! 4. Fill the jar halfway with sand. Then, put a small candle in the sand and wrap a piece of twine or ribbon around the top of the jar. 5. I found this idea on Oh Lovely Day! Place old family wedding photos and your engagement photos in the jars and place them around centerpieces. 6. Put a small colored glass votive inside of the mason jar. A simple and creative way to add some color! 7. Use the jars as cups for drinks! This is a really cute idea for summer weddings. 8. One of the newest trends for centerpieces I keep seeing is a plant submerged in water. Here is a really beautiful idea I found on Better Homes and Gardens using cranberries, candles, and greenery. 9. Fill a mason jar with sand and place the head of a flower on top. Pale pink roses look beautiful against the color of the sand.